[A]fter eight years on the sidelines, the nation’s preeminent conservative lawyers group was in an especially celebratory mood. No outside group has had more influence on nominees for lifetime federal judgeships in the Trump era than the Federalist Society, and few people more influential in helping achieve that goal than its executive vice president, Leonard Leo. Leo, after all, had a central role in advising first the Trump campaign and then the Trump administration on judicial prospects, in conjunction with the Heritage Foundation. It’s a job he had spent many years preparing to perform as he helped build the Federalist Society from a group for conservative law students into a highly influential network of right-wing judges and law professors, bankrolled by the Koch Brothers and other wealthy interests concerned with reining in Big Government and inhibiting progressive cultural developments. The guest speaker at this year’s Federalist Society bash was the American Beauty Rose of Leo’s careful judicial gardening effort: Supreme Court Justice Neil Gorsuch. 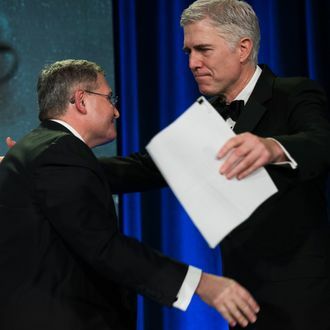 Safely planted on the High Court, Gorsuch was able to dispense with the cautious nonpartisan pieties of his confirmation hearings and acknowledge his deep kinship with Leo and the “originalist and textualist” thinkers who were busily working to reverse old liberal precedents and prevent others. Even before Trump’s election enabled a new wave of carefully vetted conservative judges, the Republican Senate had ensured it would be enormous by systematically obstructing Barack Obama’s judicial appointments, particularly during the last year of his presidency (thwarted SCOTUS nominee Merrick Garland was just one casualty). When Gorsuch was appointed, that same GOP majority made his confirmation easy by abolishing the filibuster for Supreme Court nominations. Subsequently, Senate Judiciary Committee chair Chuck Grassley sped up confirmation of Trump’s and Leo’s Court of Appeals and district-court appointments by reversing his past position and junking the “blue slip” precedent letting individual senators hold up or veto judges from their states. Yes, it’s a sweet moment for the Federalist Society and its beneficiaries, from social conservatives wanting to recriminalize abortion to libertarians who view federal regulation of businesses as largely illegitimate. But there is a threat on the horizon that could grow much larger on December 12: the specter of a Democratic Senate. With a Democratic wave election next year appearing more likely every day, and the GOP’s Roy Moore disaster in Alabama making Democrat Doug Jones the front-runner for Jeff Sessions’s Senate seat, there is now, for the first time, a plausible path to a Democratic majority next year. If Democrats win Alabama and the five 2018 Senate races that the Cook Political Report rates as toss-ups — not at all an unlikely scenario in a “wave” election — and don’t lose any of the races in which they are now favored, then they’ll enter the 116th Congress with 51 senators. What would that mean for Trump’s judicial appointments and the Federalist Society’s agenda? There’s no way to know for sure, but with all 48 Democrats voting against the abolition of SCOTUS filibusters earlier this year, Democrats could bring back that great obstacle to a fifth justice ready to overturn Roe v. Wade — the great prize conservative evangelical leaders hoped for in backing the heathenish Trump for president — right away. The Judiciary Committee, which schedules confirmation hearings and votes, would be back in Democratic hands, which would also probably mean the restoration of “blue slips.” The Trump administration would be forced to negotiate with Democratic senators over lower-court judges. And on non-SCOTUS judicial confirmation votes in the full Senate, Republicans would no longer have the whip hand. Even if Republicans do hang on to the Senate in 2018, the road ahead would become very quickly rocky for conservatives. The Senate landscape in 2020 is unfavorable: Republicans will be defending 22 of the 33 seats up that year. And in a presidential election year, particularly if Donald Trump is running for reelection, Democratic turnout should be maximized. It would obviously be a mistake to rule out a second term for Trump. But from this distance, his persistently low job approval ratings suggest he’s unlikely to pull off a second huge upset. All in all, conservative legal beagles should do all the celebrating they can right now. Neil Gorsuch will likely be on the Supreme Court for many years, and every week brings new arch-conservative lifetime appointees to the bench at lower levels. But the right’s conquest of the judiciary could come to a halt as early as a year from now, with Leonard Leo returning to his old digs as a power broker in exile.